Christmas has been a lonely time of year for Aaron since losing his family fifteen years ago. But now he’s seeing Craig, and though Aaron is sure they belong together, both have been hurt in the past, so they’re taking things slowly. So far, Craig has been supportive of Aaron’s struggles with anxiety—struggles that cost Aaron relationships in the past. On Christmas Eve, Aaron is closing his bookshop when Craig surprises him with a specially planned evening. Will this be the night they take that final step and deepen their physical relationship? Aaron hopes so, but things aren’t that simple. Craig has been keeping a secret…. 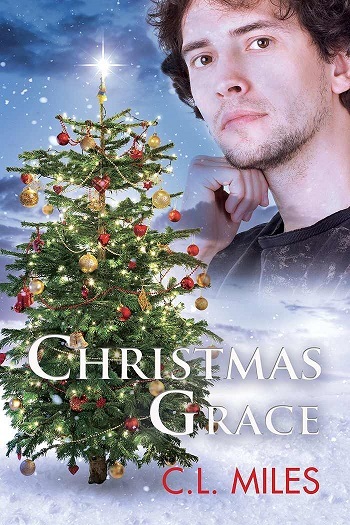 Can Aaron take his place as part of a family again and accept the love he’s missed for so long—or will he find that some deceptions are too big to be forgiven, even with the help of some Christmas grace? This is a short story about love, painful pasts, and whether or not love overcomes all. Aaron and Craig have been dating for a while now – nine months. It seems like a long time to be together and never having gone to the other's house. They almost always were staying at Aaron's. Now, if I were Aaron, I would find this suspicious; however, he thinks it's just the way it is. Maybe it was due to his anxiety, but that's not really how it felt. Then you have Craig. Despite wanting to have a relationship, it seems that he doesn't really know that meaning since he doesn't really share his life with Aaron. When his secret is revealed, it's both shocking and predictable. Overall, this just didn't work for me. It was a lot of drama with not a lot of development. C.L. MILES has lived in the suburbs surrounding the City of Montreal, Canada, her entire life. Currently, she resides in a quiet town about an hour outside the city where she enjoys gardening and swimming in the summer and hibernating in the winter. She shares her home with her wonderful husband who supports her in everything she does, no matter how crazy it may be. She loves a variety of music and is an avid reader of many different genres. If you don’t find her writing, she usually has her nose buried in a book or is hanging out with her laptop, blogging or chatting with online friends. C.L. began writing slash fiction in 2001, but only after much encouragement from a good friend. It didn’t take long before she realized how much she enjoyed creating her own stories. At the beginning of 2010, she decided to try her hand at m/m romance writing and fell head-over-heels in love with it. A seed was firmly planted, and a dream of becoming a published author took flight. She never thought writing that first story all those years ago would lead her to where she is today. Dreams really can come true! Reviewers on the Wicked Reads Review Team were provided a free copy of Stocking Stuffers: Christmas Grace by C.L. Miles to read and review.